The gazelle is often portrayed as nature’s plucky underdog, the target of a lion or cheetah hunt gamely making his escape. But there’s more to the gazelle -- a species of antelope -- than simply being on big cats’ menus. The gazelle is a smart, adaptive and robust creature with some rather interesting characteristics. The 19 gazelle varieties can be split into two species, Thomson’s gazelle and Grant’s gazelle. The slight physical variations between gazelle types are determined by habitat. Mountain gazelles are smaller, for example. Both species of gazelle are tawny in color with brown and white markings and both have permanent horns. Grant's gazelles typically stand around 2 1/2 feet tall, while the Thomson’s gazelle is around 2 feet at the shoulder. Gazelles are lean, agile and strong with permanent horns. Most animals are sprinters or marathon runners, capable of either short bursts of explosive speed or sustained periods of moderate speed. A gazelle can outrun a cheetah, if he spots the predator in time, by weaving and cutting back to force the cheetah to break its sprint. 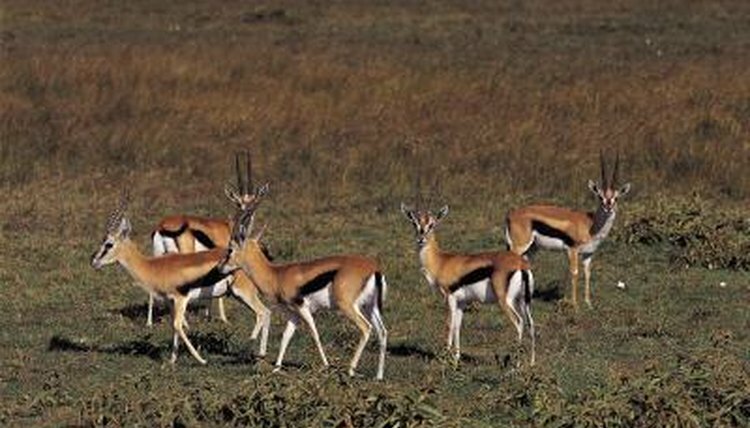 Gazelles are herbivores and feed in open grasslands. This makes them prone to attack from a number of predators, such as cheetahs, lions and wild dogs. For this reason, gazelles are highly alert and sensitive to the presence of other animals. They are constantly on the lookout and have rely heavily on their eyesight, which is excellent due to their large eyes. Gazelles have a complex and unusual social structure. They form into herds numbering anywhere between 10 and several hundred, but these herds regularly overlap. Males are territorial and often try to protect their grazing areas from other males. To communicate to other males the boundaries of their territory, they will spray scent on tall grass, but may also lay droppings in areas that they want to claim as their own. Gazelles have developed an unusual means of avoiding predation called stotting. This is a stereotypical stiff-limbed movement where the gazelle appears to bounce around. A number of theories surround the purpose of this behavior, it likely functions as warning to other gazelles as well as a demonstration of physical superiority to predators. When a gazelle begins stotting, he is saying “I’ve seen you, but just look how agile and fit I am. I can outrun you, so don’t bother chasing me."